A quiet teen girl struggles with the weight of her Catholic faith in this thought-provoking German-language drama. Maria is raised in an intensely religious Catholic family that doesn’t follow the practices instituted by the Second Vatican Council for the Roman Catholic Church. Maria’s week leading up to her Confirmation is fraught with mounting emotional pressure, by a conflict with her domineering, stern mother. German director Dietrich Brüggemann unfolds his young protagonist’s ordeal in fourteen stages based on Stations of the Cross. Told in fourteen individual tableaux that parallel Christ’s journey to his crucifixion, Stations of the Cross presents a challenging portrait of fundamentalist faith. The intense drama is deeply wrapped in Catholicism and its place in modern society, especially for fundamentalist believers. One not raised in the Church or familiar with Catholic doctrine would likely miss a significant portion of this film’s intended message. While it may be appreciated and understood by outsiders, it is an intensely personal film for believers. Maria (Lea van Acken) is a German girl raised in a devoutly religious Catholic family. Her family has broken from the Roman Catholic church as members of the Society of St. Paul. They are a Catholic splinter group that doesn’t recognize the changes in doctrine and approach wrought by the Second Vatican Council. It’s a fundamentalist brand of Catholicism practiced by this family, one that doesn’t mix well with the values of modern society. Maria struggles in school as her beliefs drive a wedge between her and classmates. Maria’s mother runs the family with an iron grip, strictly enforcing her deeply-held religious beliefs on Maria. Maria begins to see herself as a Saint suffering from torment. Like many young girls going through puberty, Maria becomes interested in a boy she meets at school. Christian invites her to his choral group’s practice, which causes a huge rift with her mother. Maria takes her faith very seriously. The week leading up to Maria’s Confirmation weighs heavily on her as she examines her own family. The restrictions placed on Maria by the devout brand of faith her family follows is slowly crushing the young girl’s spirit. Maria’s mother thinks singing Soul and Jazz music is sinful, which Maria herself possibly doubts. This maelstrom of emotional turmoil weighs heavily on Maria’s mind as she stops eating, leading to more weight loss for an already-thin girl. Maria’s path in the film closely mirrors the stages of suffering experienced by Jesus as taken from the sequence depicted in the traditional Stations of the Cross. Many will see Stations of the Cross as a movie condemning fanatical religious belief, particularly fundamentalist believers. Maria is tormented by her mother’s heavy-handed practicing of Catholicism, eventually leading to a tragic outcome. If you follow the movie closely, Stations of the Cross says more about the battle-of-wills between Maria and her mother than as a blanket condemnation of religion. 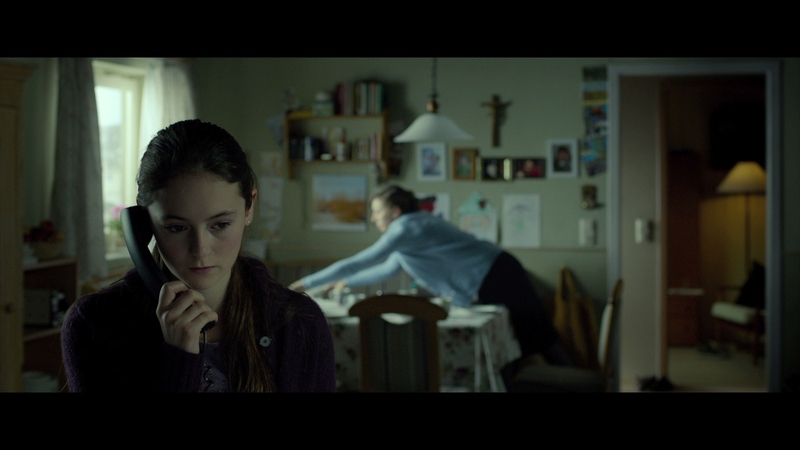 Maria’s sincere expression of faith gets trampled by a mother with severe issues of her own. That conflict underlies Maria’s suffering far more than her intense beliefs. This is a thoughtful, powerful drama that explores serious issues of faith from within Catholicism. Special attention should be paid to young actress Lea van Acken’s incredible portrayal of a girl in trouble. Completely believable and absolutely heart-wrenching at times, it is a haunting performance that elevates Stations of the Cross above most religious films that deal in such weighty subject matter. The film is not recommended for all audiences. Much of its message will be lost on those unfamiliar with Catholic practices and its recent history. Courtesy of British distributor Arrow Films, the Region B-locked BD delivers a crisp 1080p presentation framed in a carefully composed 2.39:1 aspect ratio. The structured cinematography features a bevy of still-camera shots that only change between each depicted scene in Maria’s story, paralleling each step in the Stages of the Cross. The main feature runs 110 minutes, presented in a very professional AVC encode that captures the razor-sharp definition well. A muted palette leads to slightly cooler flesh-tones and primary colors than normal. The picture quality is sharp and detailed, befitting its origins from digital cinema. The clean video has excellent contrast and clarity, revealing a high level of pristine detail down to the pores. More virtues include appreciable depth and dimension, a rarity in modern dramas of this kind. This level of picture quality falls very close to being demo material. Black levels have outstanding shadow delineation, including information that often gets clipped on cheaper productions. The transfer from Stations of the Cross’ presumed 2K digital intermediate is impeccable. Arrow has done excellent work with this BD, the film looks superb on Blu-ray. The only problematic scene is Maria’s confession to the priest, murkiness reduces clarity for that specific scene. 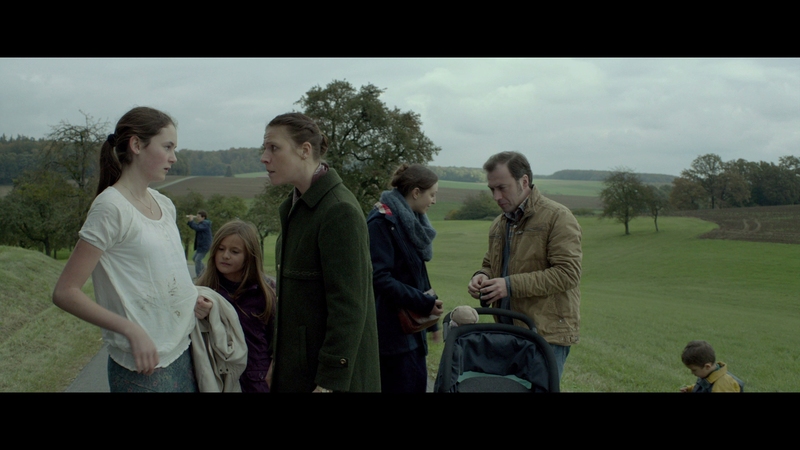 The German-language film has a bit of French and Latin dialogue. Presented in a pleasing 5.1 DTS-HD MA soundtrack, the sound is crystal-clear. Stations of the Cross is almost entirely driven by quiet dialogue. The dialogue was immaculately recorded, it comes through in perfect fidelity and intelligibility. There isn’t much to the score, some scenes go without background music entirely. The Foley effects are robust and decently capture the intense mood. The surround mix doesn’t get huge opportunities to shine and is mostly limited to the front soundstage. The mix does gain more sweep in the emotional climax. Optional English subtitles display in a white font, mostly outside the scope aspect ratio. There are no included special features except these trailers. Trailers (04:09 in HD) – Two trailers for A Touch of Sin and Like Father, Like Son play before the main menu.